Do you need to make a powerpoint presentation for your class or business? Be sure to embed a youtube video to powerpoint to magnify your points for those that are not only aural learners but visual learners as well. We break down three easy ways to add a youtube video to your powerpoint presentation whether you’re presenting offline and/or online! Screen Capturing Youtube videos download them as files onto your computer. In regards to adding a youtube video to a powerpoint presentation, there are two things screen capturing achieves. As far as inserting a Youtube video as an online video to your powerpoint presentation, this was first made possible in the Powerpoint 2010 version using its own unique plug-in tool. This method requires a little more time and precision to achieve towards inserting a youtube video to your Powerpoint presentation. But this method does allow you to be able to customize various attributes in regards to your video using Youtube API parameters. Now that we’ve discussed each method to embed youtube video in powerpoint, let’s move step by step, on how to utilize each method to enhance your Powerpoint presentation to its full potential! In order to record your Youtube video, first, you would need to download Free Cam. Go to your Youtube video via Youtube. Find Share > Embed > Copy Youtube link within the quotes of the embed code. In this case, the link is https://www.youtube.com/embed/1JL5p1CYLSs. 2. On your internet browser, open a new tab and paste the link. To remove and hide the video title and player controls while recording, add the following to your link. https://www.youtube.com/embed/1JL5p1CYLSs?controls=0&showinfo=0 After the link is in the address bar. Press Enter. 3. Now let’s get to screen capturing! Run Free Cam > New Recording. 4. Go to Settings at the Gear Icon > Check Record System Sounds > Unselect Microphone checkbox. 5. Next, click on the red recording button to start the recording. You will see a 3-second countdown before the app starts capturing. 6. Once you’re finished your video capture, click Done. Now, the app will bring you to a new page to view what you’ve recorded. You can choose to edit your video to your liking by clicking, Edit, on the top left-hand corner. 7. After you’re done editing and making your video awesome, click Save as Video. Once you’ve saved your video, go to your Powerpoint presentation. 8. Insert your newly saved video by clicking on Video at the top right-hand corner of Powerpoint. First, go to the Youtube video of your choosing. Copy the Youtube link from the address bar. 2. Open your Powerpoint presentation and select the slide where you want to embed your video. 4. Then, paste the Youtube link onto the Youtube video section of the insert video tab. 5. After, click on the video thumbnail and select, Insert. 6. Now that you’ve inserted your Youtube video, you can now adjust the size of it on your presentation! 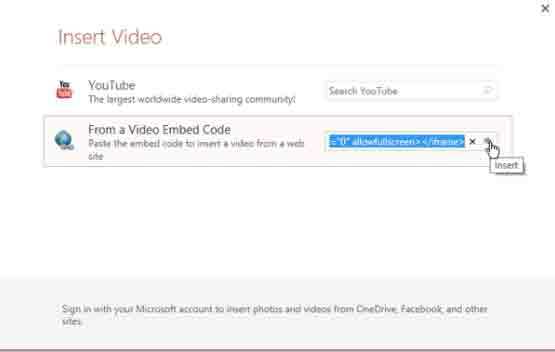 To embed a youtube video in powerpoint first find your Youtube video to then find and click Share > Embed. Copy the entire string of the embed code. Paste the link in the Video Embed Code section then, Insert. 3. Your Youtube video to Powerpoint is now embedded! Tips: To embed youtube video in Powerpoint Presentation means that you can add some extra parameters to the code to make the video play automatically or to play certain sections of the video only. For instance, by adding autoplay=1 to the code, it makes your video play automatically. Now the video will play automatically! If you didn’t notice, the “?” needs to be added to the first parameter of the code. For more information about Youtube API parameters, click here. Now Go Show off that Awesome Powerpoint Presentation! In this article, we’ve discussed several ways to spice up your Powerpoint Presentation by inserting any Youtube video of your choice. Now you know that you can screen capture your video, inserting it using a link, or insert your video using an embed code. Each method contains their own pros and cons so make sure that you test them out before you decide! We hope you guys enjoyed this article, 3 Ways to embed a Youtube Video to your Powerpoint Presentation!